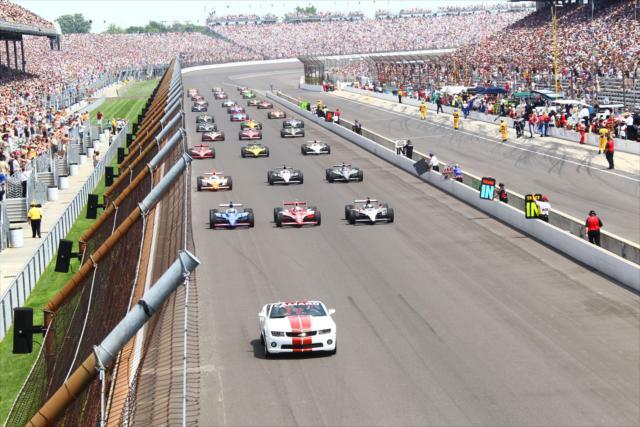 One of the most prestigious auto races in the entire world, the Indianapolis 500 has risen from a 200 lap torture test around a 2.5 mile oval paved with bricks to a 230-plus mile per hour sprint. First run 100 years ago in 1911, the race instantly became known as a fusion of speed and endurance. Competitors in the inaugural event, and for the races that have followed, knew that the 200 laps around the Indianapolis Motor Speedway was a scene where magic can happen. Earning the pole through a stunning effort on Indy 500 Pole Day eight days prior, Alex Tagliani received the benefit of starting in front of the 33-car field. However, before any racing was set to start, 4-time Indy 500 champion AJ Foyt proudly accepted the honour of driving the 2011 Chevrolet Camaro SS Convertible pace car. Giving the drivers one last moment of relative calm before the start of the 2011 Indianapolis 500, Foyt ducked into pit road just seconds before the timely green flag dropped on the 95th running of the iconic open wheel race. While Alex Tagliani was on pole position, Target-Chip Ganassi Racing's #9 car of Scott Dixon nailed the race start perfectly taking the lead by the first turn. Falling back to third behind Oriol Servia at the beginning of the 500-mile event, it seemed the magic that carried Tagliani and the #77 Sam Schmidt Racing Dallara-Honda to the front of the time sheet in qualifying had dissipated. However, eight laps later, after letting Dixon get the better of him on the start, Tagliani out-dragged the Target car down the Indianpolis start/finish line taking the lead back. The #77 Bower & Wilkins car in the hands of Alex Tagliani would lead for 20 laps early in the event but encountered complications deeper into the race event. Overheating issues on the Sam Schmidt Racing #77 car drop the Canadian pole sitter from the top-10 after the halfway distance. 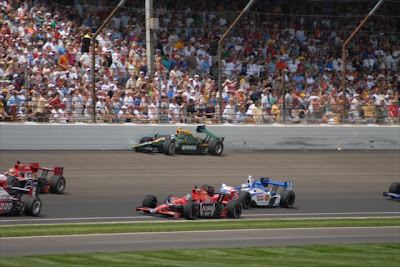 On lap 21, the first caution for the 2011 Indianapolis 500 slowed the 220-plus mile per hour field. Takuma Sato hit the wall on the race track destroying his #5 KV Racing Technology car. Fielding three cars in the 2011 edition of the Indy 500, KV Racing Technology's day would become even more expensive on race's first double-file restart when their overaggressive #59 car driven by EJ Viso made contact with the #06 of James Hinchcliffe entering turn 1. In reference to the double-file restarts, fellow competitor Marco Andretti was quoted in post-race saying "I'm going to be very frank about that and say they're trying to kill somebody. I'm glad it's great for the fans, but the risk where we're at is just ridiculous. It's a lottery." On the second double-file restart on lap 33, the Indy cars accelerated more tamely but still provided a great show. Retaking the lead, the #77 Sam Schmidt Racing car of Alex Tagliani surged around Scott Dixon. A lap later, the #9 Target-Chip Ganassi Racing car weaved back around Tagliani to resume his hold of the top race position. Leading for 26 laps, Dixon turned the 1st place position over to Dario Franchitti a lap prior to caution flying for the #88 car of Jay Howard on lap 62. When the 2011 Indy 500 concluded the Target cars led 124 of the race's 200 laps. As was proven through previous Indy 500 races, the multi-car team dynamic figured heavily (although this year it was not to an advantage. Though the Target-Chip Ganassi Racing squad claimed supremacy at the Brickyard as the reigning race team, the Penske Racing three-car team encountered a second-straight year of struggles after demonstrating near brilliance at the Indianapolis Motor Speedway for many years. The frustration started early when the team's top qualifying driver Will Power pitted during the first caution. Exiting the pit lane after receiving service by the pit crew, his #12 car lost its entire left-rear wheel causing the Australian Power to limp back almost the entire 2.5 mile distance on only three wheels. The incident on the #12 car was similar to the wheel loss that occurred to Jay Howard but Power was moving at a slower speed avoiding a crash. Power was able to stay in the race completing the race in 14th place. Crashing out of the Indy 500 at lap 156 when the #99 of Townsend Bell lowered down on the #6 Penske Racing car into turn 1, Ryan Briscoe was the only non-finishing driver in the Roger Penske cam. Relating to that Briscoe wreck, 3-time Indy 500 winner for Penske Racing Helio Castroneves was out of contention for a strong finish after having to make an unscheduled pit stop when his tires were damaged by on-track debris. Castroneves finished 17th, only the 2nd time in 11 starts that the Brazilian finished outside of the top-10. Following the caution for Howard, the race moved smoothly until just one lap after passing the midway mark in the event. Canadian rookie James Hinchcliffe, who had made it to 13th place in the race driving his Newman/Haas Racing #06 car, lost grip out of turn 3 slamming into the outer wall. On the radio following the accident, Hinchcliffe apologized to his crew. "Bertrand (Baguette) got a good run on me, and I was really just trying to let him go. I backed off early and was giving him the corner but unfortunately got a little bit in the grey. With how worn the tires were, at that stage of the stint I was just a passenger." the Indy 500 rookie of the year contender said. With James Hinchcliffe and Jay Howard out of the race, the only three first-time 2011 Indy 500 competitors remained with JR Hildebrand, Charlie Kimball and Pippa Mann. Following Hinchcliffe's crash, Newman/Haas Racing teammate Oriol Servia would take the lead for 16 circuits around the Indianapolis Motor Speedway starting on lap 113. 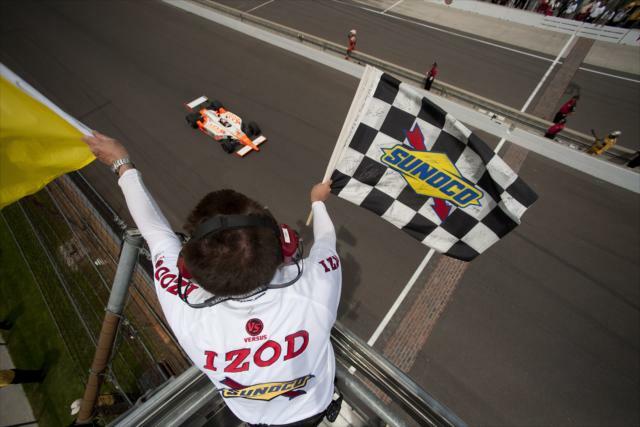 Though the 2010 winner Dario Franchitti would surge Chip Ganassi's super team back into the front spot, the presence of Servia's #2 Dallara-Honda firmly leading over highly-funded teams gave a renewed sense of open competition. After winning the race's pole and showing consistent speed early in the event, Alex Tagliani had fallen down the race's running order past the halfway point. As the Sam Schmidt Racing team sought to fix an overheating issue, the end result was a slower #77 car unable to meet the opening laps' pace. On lap 148, Tagliani's potential dream outcome in the 2011 Indy 500 was dashed when the #77 car lost grip into turn 4 severely damaging the right-front suspension. Rendered unable to finish the event, Tagliani became the second of the three Canadian drivers out of the event. Paul Tracy driving for Dreyer & Reinbold Racing was the last remaining Canadian native still running in the race. Tracy, like Hinchcliffe and Tagliani, made an impact with the Indianapolis Motor Speedway wall early requiring extensive repairs to his vehicle. Finishing 25 laps down in 25th spot, Paul Tracy would be the final driver listed as running in the race results. The Bell/Briscoe wreck amounted as the 6th caution sending all the teams to the pits with Ethanol to power their Honda engines. With 36 laps remaining in the 2011 Indianapolis 500, the scenario set up a bizarre fuel economy run. Into the late laps of the race, the Andretti Autosport #7 of Danica Patrick and the #30 Rahal Letterman Lanigan Racing vehicle piloted by Belgium's Bertrand Baguette attempted to go the distance. Patrick was forced to gave up on her effort to with 11 laps remaining while Baguette (driving a one-off effort at the Indy 500) attempted to reach the start/finish line. Regrettably like Patrick, the Belgium driver was unable to completely accomplish this fuel economy move. "It is something unbelievable. We had a good chance to win the race. We were hoping for a yellow, but unfortunately we were two laps too short." Baguette said settling for a still respectable 7th place finish. As leaders dropped in for a quick refueling, the race lead in the crucial final laps cycled to the #4 Panther Racing car driven by JR Hildebrand. 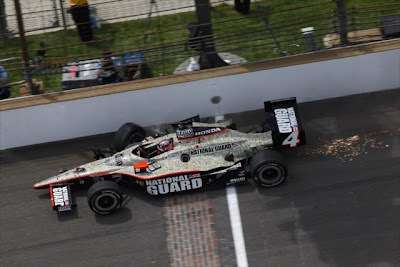 Leading at Indianapolis Motor Speedway with just 2 laps remaining, the 23-year old American driver for Panther Racing looked as if he could drive on to a rookie triumph at the Brickyard (a feat accomplished by Juan-Pablo Montoya in 2000 and Helio Castroneves in 2001). Pulling away from second place, Hildebrand needed only to maintain focus through the final 7.5 mile distance to bring Panther Racing to victory lane after three-straight runner-up finishes at the annual event. However, on the final corner of the final lap, Hildebrand loses control as he was passing fellow rookie contender Charlie Kimball. Hildebrand's #4 Dallara shot into the wall but his car kept grinding its way to the start/finish lane. Though possessing a handsome lead, Hildebrand fell victim to the #98 Bryan Herta Autosport-owned car driven by former INDYCAR full-timer Dan Wheldon. Wheldon shot past the crippled #4 car at full speed to take the 2011 Indianapolis 500. 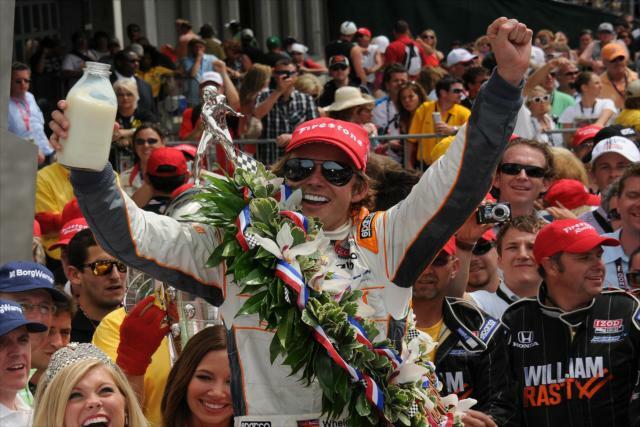 Across the line, an ecstatic Dan Wheldon took the checkered flag to claim the unofficial race victory. Wheldon's charge in the final stint was summed up by the driver in post-race . "I was just trying to go as hard as I could. I knew it was the last lap, and I knew some of those guys were struggling with fuel." Celebrating Operating as a single-car team for only the Indy 500, Bryan Herta Autosport is the first such effort to win the big Memorial Day race since the Players Racing team won with Jacques Villeneuve driving in 1995. Crossing the line under caution, there was a brief dispute on the whether Wheldon's pass was made prior or after the yellow flag flew. Bringing back some memories of the controversial 2002 Indy 500 where Paul Tracy's pass on race leader Helio Castroneves was discounted, the challenge against Dan Wheldon's win came and went with the British driver retaining his honour. "I love Indianapolis. I love the people, I love everything about it. The tradition, the history. I just felt a lot of relief. It's an incredible feeling. I've been runner-up two years before this, but I never gave up.". Wheldon's second Indy 500 win following a 2005 victory with Andretti-Green Racing, his year's success was extra special for many personal reasons. After driving for Panther Racing last year for the full-time IZOD INDYCAR series schedule, Dan Wheldon entered the location of his best 2010 finish as a healthy scratch from the 2011 season. Wheldon;s personal life has also consisted of the high of him and his wife's second son Oliver and the low point being his mother's recent diagnosis of Alzheimer's Disease. Mounting a strong run which included 6 laps in the lead, 22-year old Graham Rahal achieved a 3rd place finish. Started deep in the field in 29th place, Rahal and the Chip Ganassi Racing team (a largely autonomous group from the Target-Chip Ganassi Racing organization) fought their way forward in the freshman effort for the 2011 IZOD INDYCAR Series. Rookie teammate Charlie Kimball provided a respectable showing arriving from 28th in qualifying to 13th place in the final Indy 500 results. Driving #58, KV Racing Technology had Tony Kanaan remaining in the race as the team's last chance at success following the retirements of Takuma Sato and EJ Viso. Fortunately, as the race endured, the Brazilian would not disappoint. Still seeking his first Borg-Warner trophy, Tony Kanaan came home in a quiet 4th place. Congratulating Dan Wheldon after the race, Kanaan identified with the once full-time IZOD INDYCAR driver through his own situation starting the season with KV Racing with only five days before the 2011 tour began. " I am surely happy for Dan (Wheldon). He's been through a lot. He got thrown out the window. A lot of people said that he wasn't good enough. I've been through that at the end of last year." Tony Kanaan said. 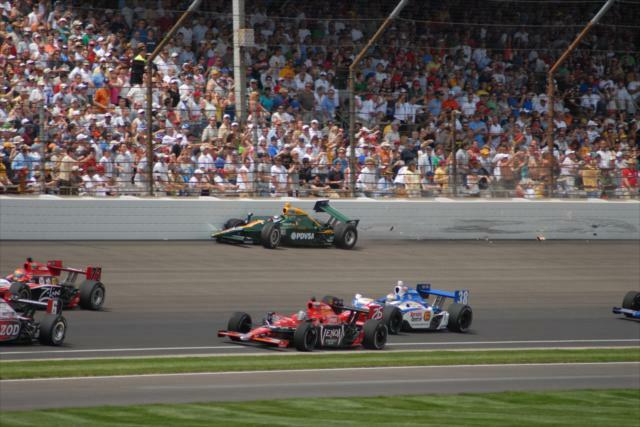 In order, Scott Dixon, Oriol Servia, Bertrand Baguette, Tomas Scheckter, Mario Andretti and Danica Patrick wrapped up the top-10 for the centennial running of the Indianapolis 500. The final year that Honda engines will be the sole power supplier of the IZOD INDYCAR Series, this his been the 6th consecutive year there were no reported engine failures following the 500-mile distance. Wtih the excitement the 2011 Indy 500 brought, there are high hopes for the 2012 event.